The Hebridean shoreline provides the inspiration for this unique range of hand-crafted stoneware pottery products. Natural beach-weathered sea fragments, provide some of the delicate textures captured on the surface of the clay. 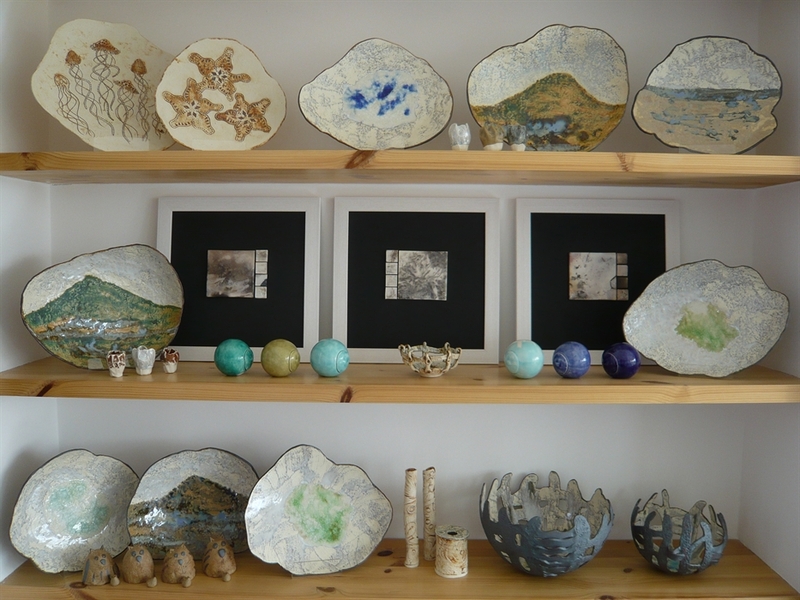 Set in a stunning location overlooking the sea loch of Locheport, with views over the Minch to Skye, Shoreline Stoneware gallery offers visitors a unique view of the Hebridean coastline. These beautiful individual pieces, capture the rugged beauty of the Hebrides. The changing light and seasons are captured in the use of glaze and recycled glass. Natural beach-weathered sea fragments, abandoned at the high-tide line, provide some of the delicate textures captured on the surface on the clay. Each piece of pottery is hand-crafted and captures texture from natural materials and found objects, collected along the shores of Uist & Barra. Work includes stoneware bowls with Uist landscape and beachscape designs. Rock-pool pebble bowls with locally recycled glass. 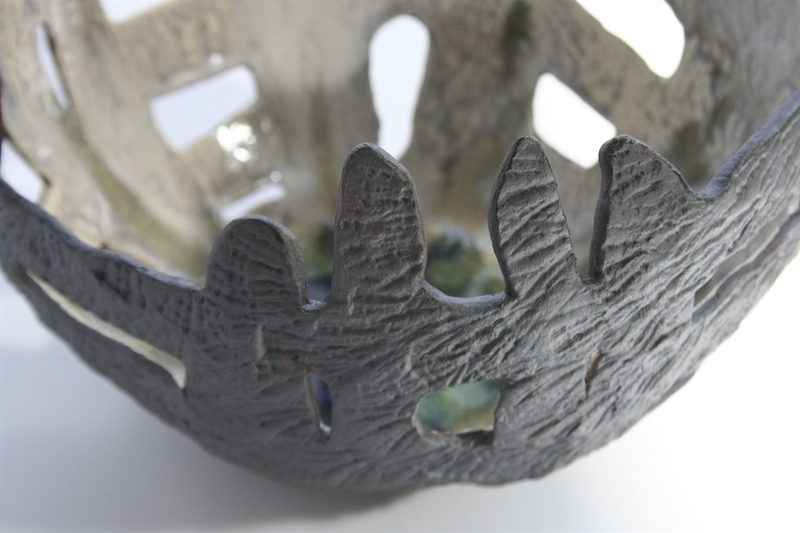 The stunning, finely formed, Sea-Urchin vessels and Kelp Forest Pools, each have their own identity with delicately carved detail and embossed shore textures. Hand-crafted tile mosaics, barrel fired in peat and fine porcelain shore textured cards, all make unique gifts. Early morning visitors to the gallery often have the chance to see 'Bryan' a young male otter fishing for green crab on the loch below the gallery windows. Current work, uses naturally derived glacial moraine deposits from our North Uist croft. Using this as a glaze wash, to the exterior of the Kelp Forest Pools. The tonal effect produces colours akin to the rich kelp-forest browns, oranges and chestnuts, in light matt to a deep glassy sheen. The result of combining this material with traditional stoneware glazes and recycled glass for the inner wall, provokes a sense of stormy misty blues and tidal rock pools with sea foam. The addition of textures and design from a combination of beach materials and hand-carved printing blocks, complete these constructed, high-fired kelp-forest pools. A unique reminder of your visit to the Hebrides. Look out for the 'Art & Craft' sign at the junction from the A867 and Locheport road B894. Shoreline Stoneware is situated 1 mile along the B894 Locheport road. As the Old Pier comes into view, look out for the sign at the end of the drive, on your right hand side. Ample parking and camper-van turning at the gallery. Commissions are also available, please contact us to discuss your individual needs.